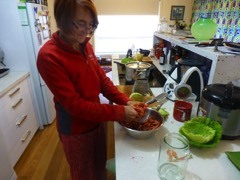 Keep 1 or 2 cabbage leaves for weighting down the top of the jar to keep vegetables under liquid. Sprinkle salt over vegetables and massage thru until the liquid starts to ooze out. You need the liquid to cover the vegetables. Pour over the whey and allow to sit for a few minutes whilst you prepare your jar. 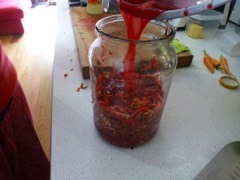 Your jar should ideally just leave a 2/3cm gap at the top between the lid and food. 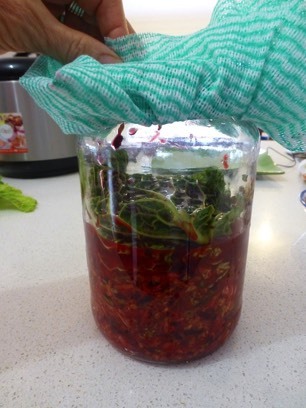 Stuff and press your vegetables into the jar firmly, ensuring the vegetables are completely covered by liquid. Seal the vegetables in the jar with cabbage leaves and make sure that the liquid stays at the top.A weight may be needed. Cover jar with a muslin cloth or chux held tight with an elastic band. Store in a dark cupboard at about 25˚c for 3-7 days depending on the temperature. Taste and if how you like it, secure with lid and store in the fridge to be eaten over the next couple of months. Any vegetables and some fruits can be used but traditionally it is just cabbage. I believe onion imparts a very strong flavour. If you have no whey you need to use 2-3 Tablespoons of salt as this is the preservative. See my yoghurt cheese recipe to make whey. A little mould growth on the top is harmless and can be scraped off. However if it smells or taste wrong please discard. It is best to use glass,plastic or melamine implements when dealing with lacto fermented cultures. Not metal. Use whey from cheese making, to reduce the salt content and for added gut flora. 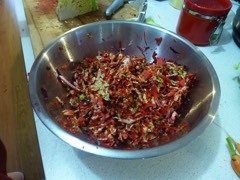 A colourful mix of vegetables, red colour is from beetroot.